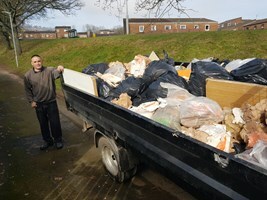 Andy's Garden & House Licenced Waste Clearance - Rubbish/Waste/Clearance based in West Wick, Avon. With 3 years experience within the waste industry I have recently opened my own business as a sole trader covering South-East Wales, Northern Somerset and East Goucestershire. I am always looking to complete any job to full customer satisfaction and I am fully licenced & insured waste carrier dealing with scrap cars, recycling, waste/warehouse cleaning and more which can be seen on my services page. I am availbale to give free quotes for all domestic and commercial work so please give me a call on the details listed above and I will be more than happy to help. Weston-super-Mare, Bristol, Somerset and North Somerset, South-East Wales inc. Cardiff & Newport and East Gloucesterhsire.